This is Ian and Karen’s story, about how they discovered their little three year old daughter was allergic to nuts and getting that first anaphylaxis diagnosis… Ian tells the story about how something so simple as feeding the birds started the allergic reactions. In March 2014 my little girl JoJo and I were out in the garden feeding the birds, as per usual, but this morning’s feeding of the birds was about to change our lives! It just so happened that I had to book time off work as JoJo was ill over the weekend, so I had to look after her as my wife Karen was working. I was washing up and JoJo was on the sofa playing on the tablet, she was complaining that her eye was feeling funny. I looked at it but couldn’t see anything physically wrong with it, so I gave her a wet tissue to put on her right eye. In less than two minutes she started crying and said that her face was hurting, I looked round and to my horror the right hand side of her face had swollen up and her eye was completely closed! So panicking in the usual parent manner, which I tried not to show too much, I reached for the phone and dialled 999. I told the emergency service what had happened to JoJo, but couldn’t explain why. Her face was swollen but her breathing was ok, she was responding well at the time. They told me because her breathing wasn’t compromised it wasn’t classed as an emergency call out and I should take her to the doctors. So I gave her some antihistamines and we went straight to the doctors for an emergency appointment. The doctor told us that she had the symptoms of an anaphylactic shock and stated that he was angry at the emergency services as this could have lead into having a full blown anaphylactic shock! Anyway a trip to St Peter’s Hospital was in order, her face was still swollen but it wasn’t any worse or better. My wife arrived a bit later and we saw the doctor who explained everything to us. It was stuff that we didn’t want to hear. 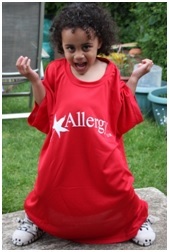 Being told that your little girl has life threatening allergies was a big blow to us, but as JoJo was only 3 years old she didn’t understand what was happening. As many of you know it’s really difficult to manage something like this, especially when it’s your child you have to be on guard 24/7. Everything we purchase with a label whether its soil for the garden, drinks, cereals or hair products has to be thoroughly checked for traces of nuts. One mistake could lead to her having a full blown anaphylactic shock. So since last year I took part and completed the 100km Nightrider 2014 across London in June, held an assembly at my girl’s school at Bell Farm with the help of Julia Kitchenham to raise money and awareness in September 2014, completed the London to Windsor ride 2014 and also took part in this year’s Nightrider 2015, to which I managed to help get a full team together. 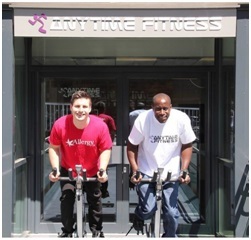 I am also working closely with the Anytime Fitness Gym in Twickenham. The gym’s manager Simon Parish and I held a gym event in December 2014, which was to row, cycle, run, walk the equivalent of 1000 miles. 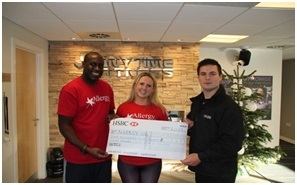 With the help of Simon, his staff and the gym members we had fun and raised money for Allergy UK. UK’s Leading Dairy-Free Protein Drink – Re-energise the Dairy-Free way with Everything But The Cow’s range of all-natural protein based drinks. Soya protein (non-GMO of course) is blended with real fruit and a touch of honey providing a delicious, healthy and balanced option for active adults and children on-the-go. Nothing added. There will also be a range of health, well-being and fitness products provided by myself for sampling. With the help of Anytime Fitness Twickenham this is set to be a great fun filled 24 hours, and there are many members of the public taking part to make this happen, to which I am very grateful and thankful to be a part of! 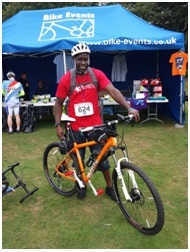 It is people like Simon, his staff and the public that help people when they most need it by taking part in events like these. They also inspire me to do more and come up with more ideas. So please feel free to come along and take part in our charity event, try out some products, put a sweat on by having a session on a spin bike or if you’re feeling really energetic take part in the insanity class at 12 midnight on the 27th!! Hope to see you there and thank-you for reading.